As AMA members, most are aware of the high quality content and discussion that goes on at monthly meetings, special interest groups and more. At the local chapter level, there is no shortage of opportunities to learn, network and grow as a professional marketer. That said, there are a variety of opportunities from the national organization that our members may not know about. Here’s a quick rundown of the various opportunities, and to learn more please visit www.ama.org. Fear not, fellow marketers, the AMA is here to help. 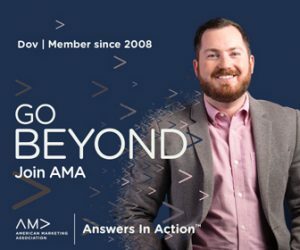 With your membership in the AMA, you have access to Marketer Toolkits, which can be accessed via ama.org under the Resources menu. Here you’ll find toolkits with downloadable resources for content marketing, market research and marketing communications. Each resource is customizable and can provide you with the tools to hit the ground running with your next project. The world of public relations has a very prestigious distinction – the Accreditation in Public Relations – or as most of us know it, the APR. Did you know that the AMA offers similar accreditations as a Professional Certified Marketer? In fact, there are PCM specialties such as digital marketing, sales management, content marketing and marketing management. The AMA provides a variety of study materials and practice testing resources to help you gain this accreditation. The test is conducted 100% online and is multiple choice. These certifications not only provide you with a deep body of knowledge for each specialty, but also provide you with a certification that appeals to employers and clients alike. If you have any questions about the benefits extended to members from the national organization, please contact any board member AMAOKC.